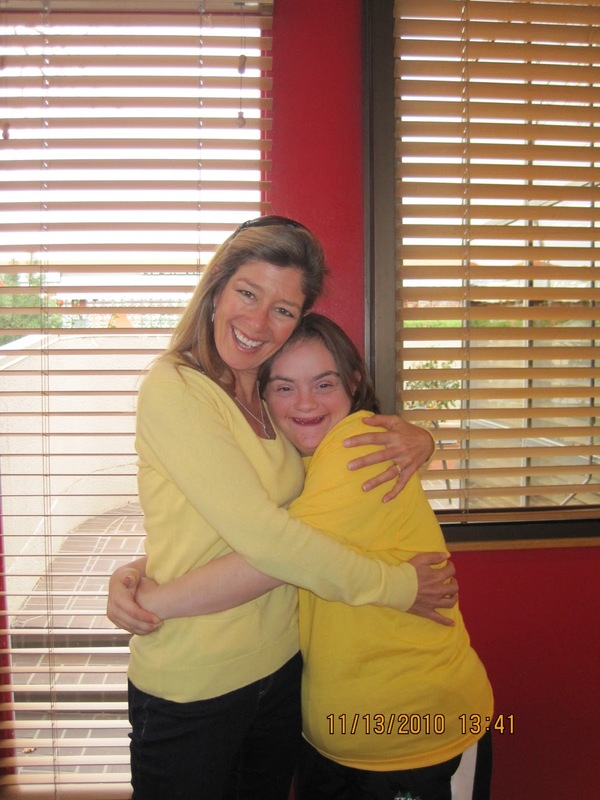 The Ordinary Life of an Extraordinary Girl: What a difference a Darlene makes! What a difference a Darlene makes! I was originally going to call this entry “what a difference a year makes". But I have reconsidered…it wasn’t the 365 days that provided a much more successful bowling competition for Alex; it was the friends who came to support her. 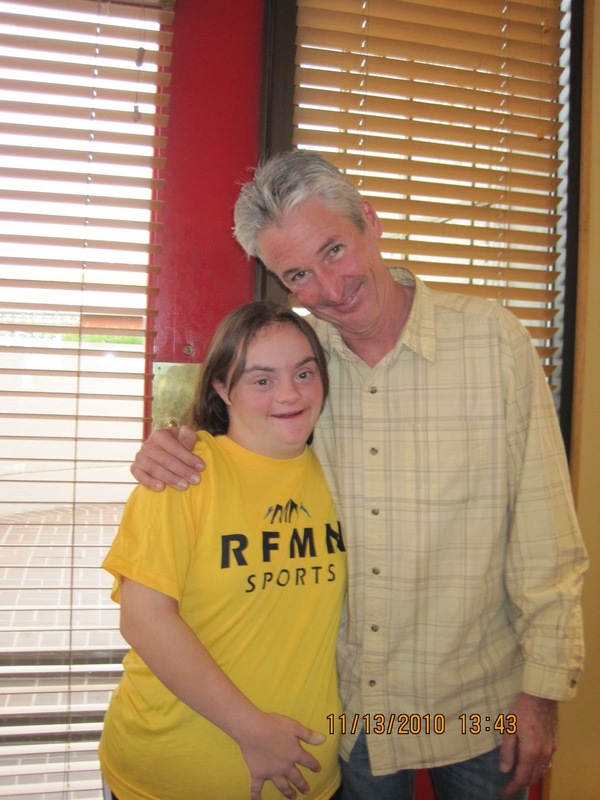 Last year at the State Special Olympic Bowling Competition Alex had a three game combined score of 216. She sat in a corner and cried because she was so unhappy; not only with her score but also the recent passing of her grandfather. She would not listen to me or reason. It was tough for me too, I have difficulty working with Alex on grief, I believe she feels it so deeply she cannot get distracted until she processes and adjusts. Words of comfort and hugs do not work until she is ready and the day was sacrificed. It was a bad day all around. Flash forward to today; one year later, Alex had one of the best days in recent history. Although school has been going well, as is play practice and basketball try-outs, the Alex of old, the happy, loving and care free girl I fell in love with 17 years ago has been on hiatus. She is happy on the outside, but sad on the inside. Alex has grown a lot recently and has a much mature view of peers and peer relationships. She recognizes she does not have any true friends at school, merely 400 acquaintances. None of these acquaintances are girlfriends she can talk to, those friends who offer encouragement and appreciate you for who you are. The friends we all need are hard for Alex to find. We are working very hard on this, but right now it is baby steps. Back to the Games - this year Alex had a combined three game score of 281 with a final game score of 117, including a strike in the 10th frame. I have never ever been able to bowl anything close to that, and especially pull off such a pressure shot which catapulted her score over that evasive 100 point mark. What was the difference this year? What is that fact that "T" proposed to her five times? (more about that later, although Alex declined for now) or she has begun to remember grandpa with happiness, instead of tears? A little bit of both I suspect, but I know it was mostly Darlene! I spoke about Darlene earlier. She is one of those people you are lucky to have in your life. She befriended Alex when she was a baby and has been one of her truest friends for the last 17 years. She lives 2 hours from us in the summer, and 4 in the winter due to those darn mountain passes that become impassable. Darlene and her husband Tim, also one of the truest people I know, were in Denver today for an interview and the timing worked so well they were able to come to the Competition and cheer on Princess Alex, as Darlene calls her. They arrived towards the end of the second game and from that second on Alex's show-off skills were in full force. Alex LOVES an audience and performs well when she has her own cheer leading squad. As soon as Darlene and Tim arrived the strikes and spares began…I lost count but at least 5 strikes and 5 spares populated the frames. It was Darlene, her cheers, her hugs, her encouragement and her enthusiasm that changed the mood in our little area of the bowling alley immediately. She became the leader of the team, the head cheerleader, and the conductor of the music. Darlene was joined by Tim, Jennifer and Lizzie. Jennifer and her family moved to Denver in August from our old town in IL. They were some of our closest friends in IL, Jennifer, my friend and Lizzie her daughter, one of the most incredible 14 year old girls I know. I missed them so much when we left IL and am so glad there are only 3 hours away from us. It was a beautiful day. Alex smiled the entire three games, accepted her third place medal like a gracious athlete and became the Alex of old, happy and confident. Alex had one of the best days I have seen in awhile. She high fived so often I am surprised her hands are not chapped! Alex's friends propelled her to a place she has not been for a long time. She was included, encouraged and part of the gang. These four people have known Alex most of her life, and have always accepted for who she is. They respect her, treat her as an equal and have a relationship built on love and trust. Those friendships Alex has not yet made at school were there in Denver. CO waiting to be refreshed; and picked-up where they had been left off. Darlene and team made Alex a star during these three short hours. She shone brighter than she has in a long time. Alex was a rainbow, and a pot of gold. She was magic, joy and love. Alex made me proud and happy. This day will stay with Alex for a long time. She will talk about Darlene, “who calls me Princess”, Tim, Jennifer and Lizzie for a long time. She will remember her third place medal with happiness, instead of the disdain she usually holds for all non gold and silver medals. Not only was Alex excited to see our friends, so was I. I too miss these longtime friends, the people who know me best and support me through good and bad times. Nothing beats a good friend and this was reinforced to Alex and me today. Thanks Dar, Timmy, JJ and Lizzie….you are the best! Darlene writes an incredible blog. It is called The Metamorphosis of a Mother, she shares the story of her transition from a mom of three to a mom about to become an empty nester. I encourage you to all read her entries; I find honesty and encouragement in her words every day. WATCH ALEX AT THE MEDAL CEREMONY! Adorable! You are so right about friendships. It pains me to hear that the light might get dimmed but it's heartening to hear tat there are moments of re-ignition. Congrats! Way to go Alex!!! Cassie's bowling competition is Wednesday. She did bowling a few years ago and won a ribbon which she was NOT too happy about after winning several medals in track and field in prior years. I've been trying to prepare her, but let's hope she medals! Sure would make my life easier. Darlene and the others are good friends. Good Luck to Cassie...and thanks for continuing to read about Alex. Is Cassie goubng back to camp next year? Friends are so very important! I am so thankful for her happiness! Cassie won a bronze medal today. Yay!! Yes, she will be going to camp again, hopefully in June and August. She loves it and we have come to enjoy our week of silence!